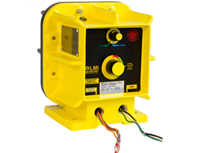 The Series E7 Explosion Proof Electronic Metering Pump is designed for use in hazardous environments. It meets or exceeds all standards for Class I, Division I, Groups C and D; Class II, Division I, Groups E, F and G. The rugged, urethane coated, cast housing and encapsulated electronics provide excellent chemical resistance and long life. Click here for LMI E7 Series Detailed Specifications.